In multiple interviews, show runner Vic Mignogna talks about how he wanted STC to have stories about something. Many fans had pitched him space battle episode ideas with Klingons and the such, but the original series had relatively little of that. Instead, TOS scripts had social relevance, reflecting societal issues of the day through a sci-fi “lens.” Star Trek gave us stories that made us think, that had moral dilemmas where things weren’t always wrapped up neatly in a bow. And that’s the foundation on which STC’s second episode was conceived. Vic co-wrote “Lolani” with Huston Huddleston, who in turn finished the teleplay with Paul Bianchi. Like their first episode, “Pilgrim of Eternity,” (which featured a theme of redemption through self-sacrifice), their second episode also touched on an important subject: human trafficking, which is a very real problem in our world today. Conveniently, Trek already had the perfect foils for an episode about this subject: the green-skinned Orions and their intoxicatingly sensual slave women. Surprisingly, TOS itself never dealt with the seemingly incongruous existence of an active slave trade in an otherwise utopian future. On the other hand, Orion wasn’t a member of the Federation… and thus does the episode introduce the primary conflict of Lolani’s story. The challenge of such an episode, of course, was going to be actor make-up. “Lolani” featured two prominent characters that would have large amounts of exposed green skin: Lolani herself, an Orion slave played by the mesmerizing Fiona Vroom, and her brutish Orion owner Zaminhon, played by Lou Ferrigno. Ferrigno was no stranger to green body make-up, having played the Incredible Hulk on the live-action TV series from 1977-1981. But this green make-up was going to look noticeably different and include a beard and bald head (not very Hulk-like). His face, neck, hands, and very muscular arms would need to be colored, while Lolani would be doing many of her scenes scantily clad, requiring massive coverage of green make-up that (hopefully) wouldn’t get all over the place…including on all those nice uniforms and set pieces! For the green coloring, Tim and Lisa used a mixture of adhesive and acrylic color, called PAX, so that the green would not transfer onto the sets or costumes. A custom-matched cream make-up was used for their faces. Each day, Fiona’s Lolani make-up took a crew of three make-up artists five hours to apply. Lou Ferrigno’s make-up took about three hours. When they were done each day, it still took hours more to remove all the make-up! But it was worth it, as the two characters were among the most visually interesting of any seen in any fan film so far…and their strong acting only enhanced the impact. Ferrigno wasn’t the only notable sci-fi genre star to appear in this episode. As a frequent guest at signing conventions, Vic knows a lot of industry folks, and he convinced Erin Gray (who played Captain Wilma Deering on Buck Rogers in the 1980s) to play a Starfleet Commodore, as well as Daniel Logan (who played the young Boba Fett in Star Wars: Attack of the Clones) to play the Enterprise navigator. Daniel “young Boba Fett” Logan and Erin “Wilma Deering” Gray. Released in February of 2014, “Lolani” was a huge hit with fans, even more than STC’s first episode. 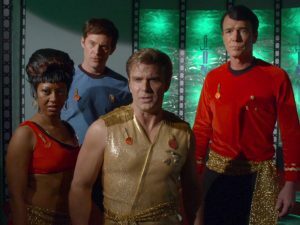 This was considered to be a huge triumph for the team, as this time they weren’t relying on a sequel to a TOS episode but instead presenting a truly unique and stand-alone story. Vic had stepped aside from directing (Chris White directed “Lolani”) allowing him to concentrate more on playing Kirk correctly and avoiding the stigma of imitating a caricature of Shatner’s acting style. Michele Specht’s new character of Counselor McKennah also got a chance to really shine as a foil for Kirk, setting up some interesting tension between the two of them. If make-up was the biggest challenge for their second full episode, then costuming was the major obstacle for their third. “Fairest of Them All” wasn’t so much a sequel to the TOS “Mirror, Mirror” as an extension of it. We all know what happened to “our” Captain Kirk after he and the landing party returned from the mirror universe. But what about their counterparts? Was Mirror-Spock able to find a way to spare the Halkans after all? What would Mirror-Kirk do now that he was back on the ISS Enterprise? In an episode co-written by Vic and James Kerwin (who also directed) from a story by Vic, these questions and more were answered…in an exciting and suspenseful way. 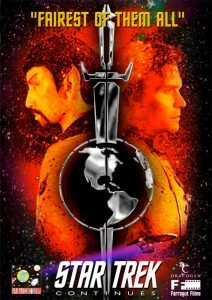 In fact, I would place STC’s “Fairest of Them All” in the top three MUST WATCH Trek fan films of all time (along with Prelude to Axanar and Star Trek: New Voyages’ “World Enough and Time”). Released onto the Internet on June 15, 2014, the storyline draws you in, the drama keeps you on the edge of your seat and constantly guessing, and the resolution is ultimately quite satisfying. Sure, these aren’t the exact same actors who crewed our favorite starship 50 years ago (how could they be? ), but once you put that expectation aside, the entire 40-minute episode feels like a piece of “lost” Star Trek from the 1960s. Holding up a mirror to “Mirror, Mirror”: Todd Haberkorn and Asia DeMarcos as Spock and Marlena. And the look of the mirror universe…sheer brilliance! The costuming department, which included Vic himself and was led by costume designer Ginger Holley, worked almost non-stop on the costumes from November of 2013 to March of 2014 when filming kicked off. Nearly everything had to be made from scratch! You would think they could just tweak their regular uniforms and add the Empire’s insignia, but it wasn’t that easy. Their regular STC uniforms were made from a polyester fabric similar to what TOS had used in its third season. But “Mirror, Mirror” was a second season TOS episode, filmed while Shatner and company were still wearing uniforms made of stretch velour (which is nearly impossible to find these days). And then there was Kirk’s sleeveless sparkly gold vest, perhaps the toughest piece to make. Ginger found a vintage woven gold metal lurex fabric and hand-stitched two identical vests just in case one became damaged in the fight scenes. The attention to detail on those costumes and their adornments was the icing on this oh-so-sweet cake. 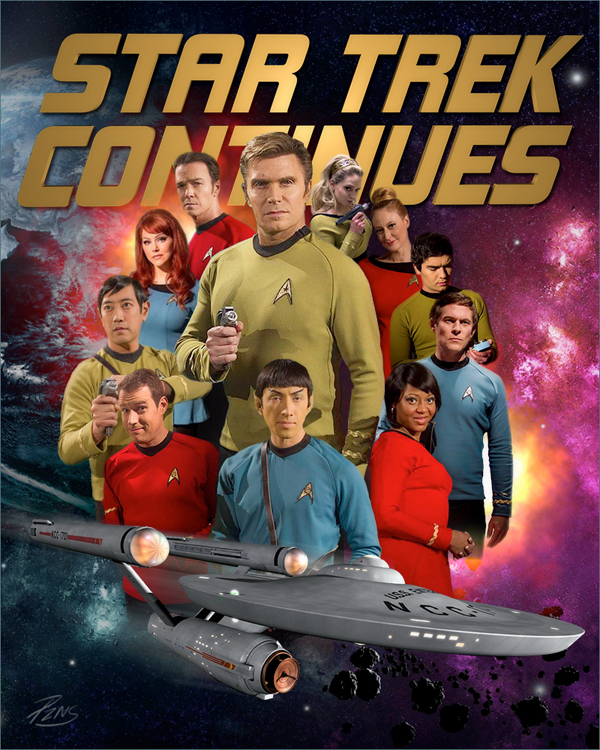 Fast forward to January of 2015, and things were very busy at Star Trek Continues. First and foremost, a week of filming took place for “The White Iris,” the last of the three episodes funded through their first Kickstarter campaign. But now it was time for another crowdfunding campaign, and it kicked off on January 17 with a goal of $100,000 to film two new episodes. Spocko and Vic make the fans a Kickstarter offer they can’t refuse…ya know what I mean? Their Kirkstarter 2.0 was supported by a huge social media campaign and a series of some of my favorite-ever Trek Kickstarter videos. 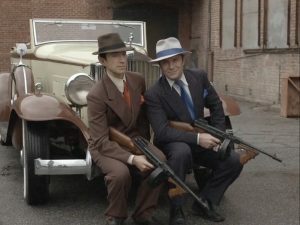 Wearing 1920s-era gangster suits, Vic and Todd played Kirk and Spock from “A Piece of the Action” to a T; they even had a beige 2-door jalopy coupe! 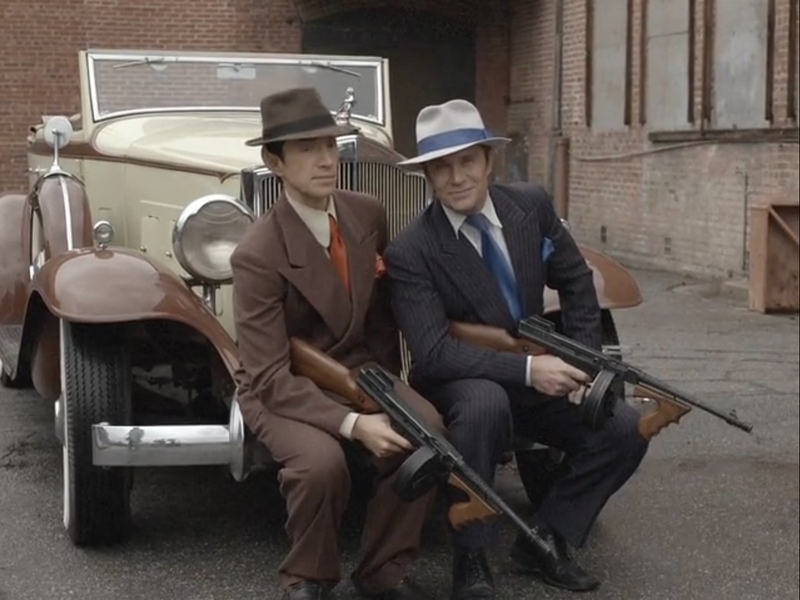 (Granted, it’s not the 1931 Cadillac 370A V12 that was used in the original Trek episode, but it’s pretty close.) Take a look at this video and this one (other videos in the series can be linked to from the thumbnails at the top of the video pages). 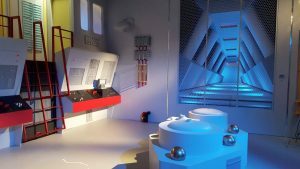 The Kirkstarter blew away all expectations, taking in nearly $215,000 and allowing STC, with the extra funding, to construct an amazing full Engineering set along with an alien planet set. “The White Iris” (co-written by Vic, James Kerwin, and Chris White, and directed by James Kerwin again) was an interesting departure from anything STC had done before. A relatively “quiet” episode, “The White Iris” felt more like a dramatic stage play than a typical Star Trek fan film. It’s a journey, of sorts, through Kirk’s psyche as he deals with the “ghosts” of women from his past who have died, and it provides an amazing opportunity for Counselor McKennah’s character to really develop. I won’t say more, as the ending is one of the most beautiful tear-jerkers (yes, dammit, I cried like a baby!) that I’ve ever seen in ANY Star Trek…not just fan films. As was becoming the norm, the episode featured a noted sci-fi celebrity guest star: Colin Baker, who played the sixth incarnation of the titular Time Lord on the British series Doctor Who. Also, Martina Sirtis returned to STC to once again voice the Enterprise computer. Kudos must surely go to costume designer Ginger Holley and wardrobe supervisor Dorothy Booraem who spent uncounted hours creating amazing replicas of the costumes originally worn by the characters of Edith Keeler, Miramanee, and Rayna…plus nearly a dozen other original pieces. And I wrote this guy back—just like I’d written five other guys back—and I said, “Well, I really appreciate it, but the reality is that people just don’t write like that anymore. It’s a very specific style of writing.” And he wrote back and said, “Well, I’d love to try.” And I said to him, “Well, I’ll tell you what: our episode that we’re getting ready to do has an original character in it named Nakia. She was a young girl who served on the Farragut with Kirk when he was a young lieutenant. And just like Edith Keeler had her own theme and Miramanee had her own theme, we want this original character to have her own theme. Andy, why don’t you write something for her and send it to me, as a test, and see how you do?” And he recorded something and he sent it, and my jaw hit the ground! I was like, omigod, this guys gets it! And so I sent him the rough cut of the episode, and he wrote some original pieces for the episode. And then I flew up to Rochester, NY, where he had put together an orchestra at the Rochester Institute of Technology, and we recorded a live orchestra…never been done on a fan production before! 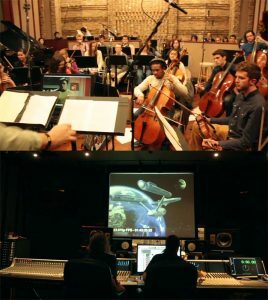 And we recorded a live orchestra playing original cues for “The White Iris.” And we had such a good time, and it went so well, that we did the same thing for “Divided We Stand” [episode 5], and he’s gonna be wiring original music for “Come Not Between the Dragons” [episode 6]. And by the way, I found out later on that Andy Farber, he’s not just “a composer,” but he teaches composition at Julliard in New York City…one of the most prestigious music schools in the country. They shoot…they score! Last year, STC became the first fan film to ever use a live orchestra to record their background music. There’s a really great video of the original recording session for “The White Iris” along with some interviews with the composer and a few of the musicians (including trumpet player Chris Rogers, the cousin of TOS musical composer Fred Steiner). It’s a short video and very much worth checking out. Whew…not a copyright crisis after all! 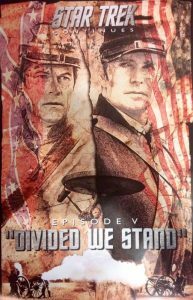 STC’s next episode, “Divided We Stand,” was actually filmed back-to-back with “The White Iris” in order to save money on travel and hotel costs, as well as on equipment rentals and other expenses. Each episode took about 8-9 days to shoot, but “Divided We Stand” required an extra little “field trip” to nearby Olustee Battlefield Historic State Park in northern Florida (about an hour from the studio in Kingsland, GA). A couple of years earlier, Vic got an idea to do an episode where the crew visit a specific period in history…which some of his favorite episodes of TOS had done. But where (or rather when) had the Enterprise crew not gone before? When Vic came up with the answer, he also came up with the solution of how to recreate another time period without blowing the budget: the American Civil War. It turned out that a local Civil War reenactment group would be staging the Battle of Olustee just a few days after studio filming wrapped on “Divided We Stand.” Hundreds and hundreds of extras would already be fighting in period uniforms with guns and cannons exploding (shooting blanks, of course!) among old military tents set up in army camp style. All STC needed to do was to convince a couple dozen reenactors to show up a little early to film some scenes in the studio and a few non-fighting scenes out near the battlefield. Then they filmed the battle reenactment itself, and the result is an episode that has probably set an almost-insurmountable bar for other Trek fan series. The Civil War battle footage was as realistic as anything you’ll ever see in Hollywood. 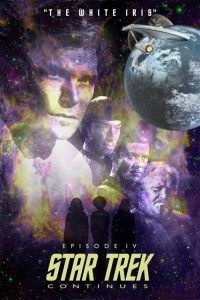 Add in a great story focusing specifically on Kirk and McCoy, masterfully acted by both Vic and Chuck, and you’ve got yet another MUST-SEE fan film effort. So what’s next for STC? 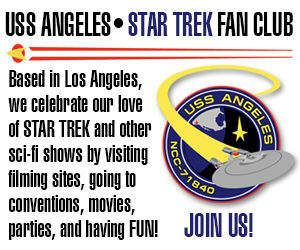 A new Indiegogo (to boldly Indiegogo!) crowdfunding campaign is underway right now. STC is trying to raise $350K, which is quite ambitious! With about two weeks left (as of this posting) they’ve raised an impressive $133K so far. If you’d like to donate–as I have–just click here. The other big news is that their sixth episode, “Come Not Between the Dragons” is scheduled to debut in May, and it will be the first TOS fan film to contain scenes shot in a complete starship Engineering set…I can’t wait! Seriously, how awesome is this??? Until then, may Star Trek Continues continue and prosper! 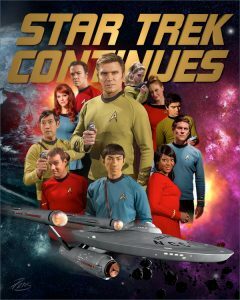 READ MORE about Star Trek Continues in this follow-up blog published after the new fan film guidelines were released by CBS and Paramount.